Recording with microphones that are out of phase is one of the surest ways to scream to the world that you are a fledgling engineer who has no idea what you are doing. Phase cancellation occurs when multiple microphones are used to pick up the same sound. For instance, on a guitar amp, you might have a microphone an inch away from the speaker cabinet and another mic several feet away to capture a bit of the sound of the room. Because you set up the microphones at different locations in a room, the sound will reach them at different times. If you think of a sound wave as a series of hills and valleys, the near microphone might intercept the sound at the top of the waveform while the distant microphone might pick up the sound at the bottom of the cycle. The result - at least on paper - is that the frequencies will cancel each other out if they hit the microphones at opposing phases of the cycle. The resulting signals are out of phase with one another. Although this is a nice little analogy, it's not entirely accurate because the sound from an instrument is made up of lots of different frequencies of sound waves and only some of them are going to be canceled out by the placement of the microphones. Rather than getting CANCELED when phase conflicts occur, the frequencies coming from out of phase microphones can actually produce a nasty COMB FILTERING effect in which some frequencies are totally canceled and others are doubled in volume. The result is an annoying facsimile that lacks bass and sounds nothing like the original sound. Phase Cancellation is most noticeable when multiple signals are "summed in mono" meaning that the signals of multiple microphones are routed to a single output. You won't notice phasing if you mix the signals of multiple microphones and spread them across a stereo field, but if you switch the monitor feed to mono, it becomes obvious. For this reason, it's important to check your mixes - especially drum sub mixes - on a mono output bus frequently. Additionally, the sources have to be about the same volume for the cancellations to occur, so if one of the microphones is mixed significantly louder than the others, phasing becomes less of an issue. I learned this trick when I was eighteen years old in Tucson, Arizona from this little old video engineer who wore his pants too high - and there is no better method on the planet for making sure that your microphones are ALWAYS In Phase. The other technique that you can use if you have phasing issues is to horizontally move the waveforms directly on the editing screen of your recording program after you have recorded the tracks. To do this, zoom in on the waveforms in the edit window until they look like continuous wavy lines. Then, using a grabber or a nudge tool, slide the waveforms so that the "Hills and Valleys" of the mics picking up the same instrument line up on top of one another. If you are using this technique, remember that you are not "Time Aligning" the waveforms. On a drum kit with multiple microphones, if you hit a snare drum, the sound is picked up by the individual drum mics as well as the overheads and the room mics. The sound is going to reach those three positions at slightly different times and this time delay actually gives the drum sound DEPTH. 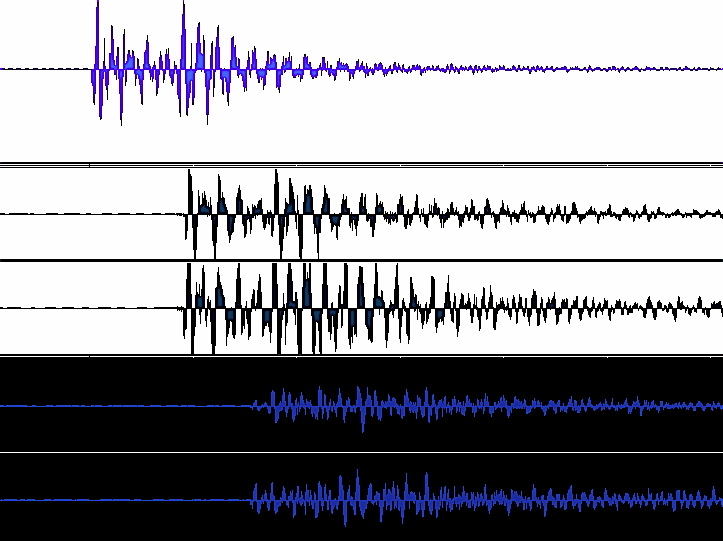 When you are editing the position of the waveforms, you want to preserve this time delay but match the hills with the hills and the valleys with the valleys of resonance cycles produced by the sound waves. One instance where you might NOT want to preserve this time delay is when you are combining a direct and an amped signal as you often do with a bass guitar. In this case, the signal from the amp will probably appear on the edit grid slightly behind the direct signal and you can nudge it a bit to the left so that it time aligns with the direct signal to give the bass sound a sense of immediacy and precision. This sliding technique at the editing stage of a project is never a substitution for correct microphone placement during the recording stage, but can be invaluable to tighten up the overall mix. Hopefully, these ideas will help your recordings keep the depth and the realism that multiple microphones can provide and keep your phasing issues to a minimum.